It was practically standing room only last Thursday evening when local award-winning author Kristen Green discussed her book, Something Must be Done about Prince Edward County. Her book tells the story of a Virginia community that defied the Supreme Court’s Brown v. Board of Education ruling. When ordered by a Federal Court to desegregate the public schools in 1959, white leaders in Prince Edward County instead chose to close them. The public schools would remain shut for five years, depriving hundreds of black children – and some white children – of an education. The author, who grew up in Prince Edward County, shared how she explored her own past while researching her book. Attendees at the book event reported feeling inspired by Ms. Green’s talk, learning something about a painful side of Virginia’s past as she mixed history and current events. At the conclusion of the program, a long line formed in the lobby to get copies of the book autographed. Prior to her talk in Lipman Auditorium, selected students from the Advance College Academy and their teachers, along with students from a variety of Reynolds’ classes, had a chance to dine with the author and ask questions that they had prepared based on their reading of Green’s book. Meet Hong Wu. 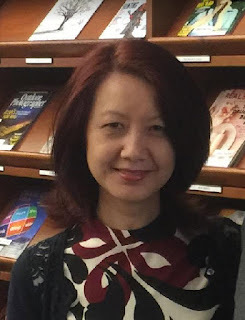 Hong works as the Director of Library and Information Services at Reynolds. I’ve been with Reynolds for 21 years. Where did you work before coming to Reynolds? I was a librarian at Troy State University in Dothan, Alabama. Before that, I was an instructor at the Foreign Affairs College in Beijing, China. What do you like best about working at Reynolds? The people. I’m honored to work with a group of dedicated and talented people. Team Library is fantastic! When I am not at work, I like to? I like to read books, travel around the world, tend to my garden and stay connected with my family and friends in China through WebChat. Dead or alive, if you could have dinner with one person, who would it be? I miss my Dad. He lost his battle with cancer right before I completed my college. Pay off my mortgage, put my children through college, and invest the rest for my retirement and charity. I attended one of the most sought-after boarding schools in China when I was a child. I won’t consider sending my children to a boarding school after my experience. Did you have any jobs as a teenager? No. I grew up in China and teenagers didn’t have jobs in my time. To get rid of hate in this world. The 14th Annual Reynolds Scholarship Bowl took place on Saturday, February 4th at Bowl America in Short Pump. The turnout of supporters ready to bowl on an early Saturday morning was amazing, as 114 bowlers raised over $2,000 towards the Classified Council Scholarship. Over the last 14 years, the event has raised more than $16,000. The Reynolds Classified Council could not have pulled this successful fundraising event off without the help of many key volunteers and supporters.